Outstanding in the cold, cold field. There's something about the virgin visit to an Outstanding in the Field dinner. A slight anticipation, an eagerness to learn about the farm and local producers, the experience of dining with strangers under the stars. Last year, as Peter and I drank wine while the moon rose over the meadow, sheep bleating behind our backs, we agreed that we should never go back. Any attempts to replicate that magical evening would fall short. It was perfection. Of course, though, when tickets went on sale last spring, I couldn't resist. We would attend Outstanding in the Field as seasoned veterans. And this time--we wouldn't forget our plates. Plus, honestly—after a week quarantined with sick kids while Peter was traveling, I was very happy we planned an evening out. We knew it was going to be chilly in North Carolina, but even with a sweater and boots I was poorly prepared for a dinner in the field. In fact, as we left our car, we noticed the trend of serious winter gear among the other guests. Hats, scarves, coats, gloves...it was as if snow was forecasted. How would the chef keep dinner warm? How the heck were WE going to stay warm? No fear. Sadly, the weather turned our Outstanding in the Field into Dinner in the Barn. Greeted by Leah, coordinator extraordinaire with the Outstanding in the Field crew, we were welcomed into a smallish outbuilding for champagne and hors d'oeuvres. 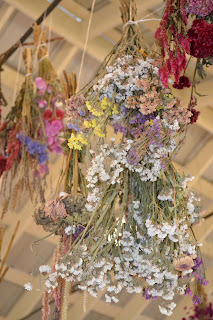 Of course, I was enamored with the drying herbs and flowers. Looking at the tools used for wreath-making, Peter pointed out that he finally knew a use for our ironing board. What a comical husband I have. Now, that is a slogan by which I can live. Did you know that in medieval Europe, it was widely believed that mustard was an aphrodisiac? Some monks were forbidden to eat mustard, while other monasteries embraced mustard making and turned it into an art form. How can a former marketing girl not love the brand “Lusty Monk Mustard”? Genius name. Herbed chocolate lab* canapé, lavender honey, French breakfast radish, microgreens*A confession. I had no idea that herbed chocolate lab was a cheese. I thought, well, this is odd. Chocolate, radishes, microgreens? Huh. Quite yummy, even if there wasn't any chocolate. Sadly, I ate it before I remembered to take a photo. from the family estate in Montgenost in the Marne Valley. The grapes are directly harvested by hand from the family vines. Directly savored by many happy guests, including Peter and me. After searching for patches of sunlight for warmth, we gathered for introductions. The Griers understand the importance of caring for the land that provides their livelihood. Rotational grazing of the herd of Red Devon cattle, no chemical or synthetic fertilizers, pesticides or herbicides, green manures, and free ranging chicken contribute to balanced, biodiverse land. Along with the produce, Anne interplants flowers among crops to attract pollinators. She creates both fresh floral and dried arrangements. ...and to the fields of organic produce. 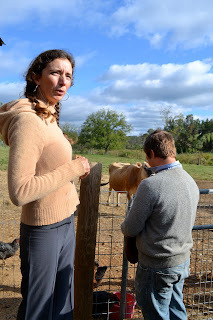 The Griers sell their produce, flowers, and meat to restaurants, through a CSA, and at several area farmers' markets. Currently, they have 20 CSA members, but by the interest among the guests, I think those numbers will ramp up considerably in the future. After the tour, we hiked up a small hill to the barn for dinner. “Barn” is quite a misnomer. It was a gorgeous barn-like structure with lovely wood throughout (hickory? ), obviously used for events rather than feeding livestock. The tables were arranged in a kind of snail shell design—spiraling continuously outward from the center of the barn. While I was quite happy that we'd be dining inside, I still missed the drama of seeing the tables artistically arranged in the field. , a larger than life, cowboy-hat-wearing land artist, was conspicuously absent. Understandable, as the OITF schedule has grown to encompass more than 80 events, including international venues. I'm sure Mr. Denevan needs a few days off. Still, his presence was missed. restaurant in Asheville. (Note to Peter: we must, must go to Asheville to check out The Market Place.) Still, a chef can only be as good as his ingredients—and the producers didn't disappoint. As we sat, chatting with some relatives of Chef Dissen's, as well as a soon-to-be wed couple across from us, we broke bread. Literally. bakery from Chandler, NC, hand crafts bread and pastries in a wood-fired brick oven. They are renown for their use of heirloom wheat, “Turkey Red,” an old Eastern European grain brought to the states in the 1800s. Using a traditional process, the original whole grain is stone-milled on site the day of baking. The dough is mixed by hand, using a slow fermentation process. It's a good thing that I indulged in several pieces of the bread to soak up the liberally flowing wine. I seriously overindulged. Seriously. To the point of giggles. Did I mention that I had been home all week with sick kids while Peter was in Barcelona? But enough about my inebriation, let's get on to the food. Truly, how can anyone go wrong with bacon-wrapped pork? Isn't bacon considered the gateway drug of vegetarians? Warren Wilson College is known for students working on campus—in the garden, on the farm, wherever work is needed. 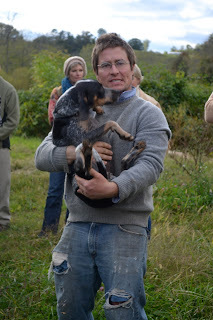 Aaron worked on the farm when he attended Warren Wilson, and the pork provided by the college was deliciously tender. 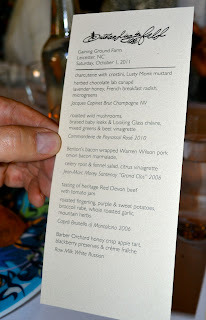 It was an outstanding evening, but with an entirely different vibe than our prior experience. Perhaps it was the battling cell phones at our table, with fellow diners preoccupied with the Clemson (and other) football games. Maybe it was the change of venue. Honestly, though, while the food was wonderful, I missed the more intimate meetings with the producers, which we experienced last year. Yes, the producers were recognized at our dinner, with many hoots and applause. But last year, they were introduced around the table, where we had a chance to really talk with them and ask questions. Talking heirloom tomatoes with a farmer last year was one of the highlights of the evening for me. Or maybe the atmosphere was less charged due to the magical, missing Jim Denevan. In any case, it was a lovely evening with fantastic service, delectable local foods, and good conversation. And really, really good wine. OITF was next heading to Tennessee, with the crew piling aboard the big red and white, 1960s bus to set up a dinner the following day. I can't imagine the energy and coordination it takes to organize several dinners a week for hundreds of guests, all in different states with varying venues, producers, and chefs. It's an amazing, awe-inspiring endeavor. Leicester continues to beckon, with the turning leaves enticing us to another Randall Glen outing. We're debating how we can squeeze in a mountain outing with all of the October obligations, but one thing is certain—Leicester leaves us all feeling rejuvenated.